Bob Conley, standing, and Jon Garber talk before the APC meeting. WARSAW — State Road 15 is poised for development of some type especially between the north end of Warsaw and Leesburg. A few years ago a special overlay district was created to regulate the development fronting and near SR 15. 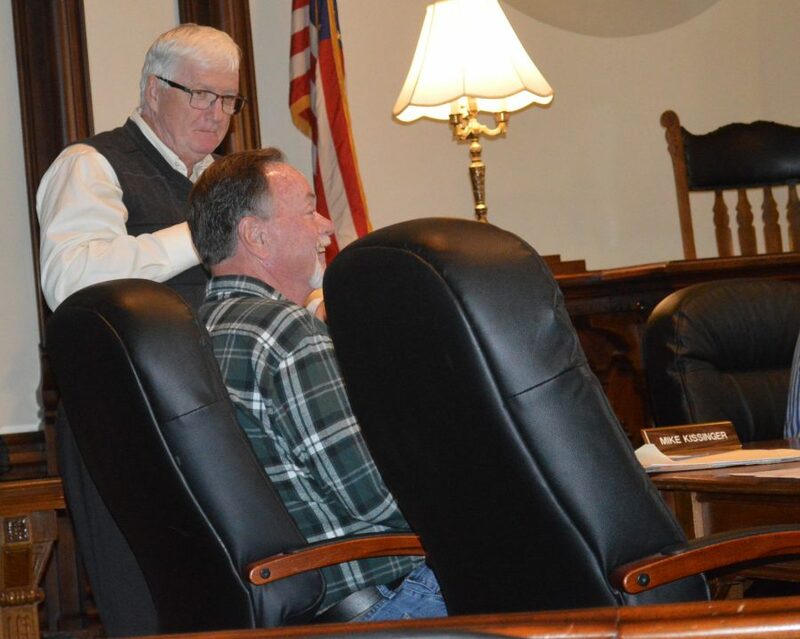 During the regular monthly meeting of the Kosciusko County Area Planning Commission Wednesday afternoon, Nov. 7, in Warsaw, the planning commission considered a petition within the overlay district. DP & P Investments petitioned the APC to rezone ground from agricultural to commercial just off the west side of SR 15 and along both the north and south sides of Levi Lee Road in Plain Township. Steve Snyder, an attorney representing DP & P, said commercial development has been anticipated for quite some time in the county’s comprehensive plan. He said the tract of ground is not likely to be developed residentially. He noted the developer is willing to limit the commercial development to the west side of the property in order for a buffer to be created between the property and nearby Valley Springs subdivision. He added depending on the type of development, the right of way for Levi Lee Road could be expanded. Trey Rodgers, president of the property owners association for Valley Springs, said residents of the subdivision are concerned because of the potential of increased traffic, a decrease in their property values and also having to look at a commercial development close to their backyards. He said there is a communal park used by the residents that is just off Levi Lee Road. Rodgers also cited some drainage problems in the past including a sinkhole in the yard of one resident causing a water backup in their basement. He said the neighborhood is attractive to the residents because it is a little out in the country, but close enough to access Warsaw. And there are a lot of kids playing in the neighborhood. In rebuttal Snyder said he understands the concerns of the neighbors and when the subdivision was developed several years ago, development along SR 15 was not anticipated. But he also noted commercial development is the most likely form of development in that area. Eventually the APC recommended approval of the rezoning and it will be considered by the county commissioners Tuesday, Nov. 27. Also on the agenda, the APC recommended rezoning 2.93 acres from agricultural to residential on Country Club Road, west of CR 75E in Wayne Township for Reinhold and Claudia Fussle. Planning director Dan Richard noted the property is in violation because of two uses on the same tract. Attorney Richard Helm represented the Fussles and said rezoning the property is the best way to address the violation. The rezoning would create three units on two lots. There is also a barn on the property and it could no longer be used for agricultural purposes once the property is rezoned to residential. County commissioners will consider the petition at their Nov. 27 meeting. In other business, the APC recommended denial of a petition by Daniel McCann to vacate a 16-foot wide platted easement in the Barbee Shores addition on the north side of Barbee Lake. It is just off EMS B1A Lane. Richard noted the easement runs from EMS B1A Lane to the water’s edge. It was noted the easement is not well maintained, but still used by nearby residents to access the lake. The petitioner is requesting the vacation for safety reasons. County commissioners will consider the request at their Nov. 27 meeting. • Approval was given for C & R Estates on CR 700S east of Claypool Elementary School for a two-lot subdivision. • Approval was given to replat three lots in Shadow Lake Estates on Old US 30 in order to create more space for a couple of residents.